As a younger artist I was often told to stick to one style or subject; to thin out my interests and find a focal point for my work. Over the years, I have found that I simply cannot do this. I find great joy in experimenting with new media and representing beauty and emotions in diverse styles. My work reflects my stages in life, my personal evolution, and each piece tells a story through colours, textures, materials, and subject matter. The current style with which I have become enamoured is liquid acrylic, a far cry from the meticulous details visible in my work from the past few years. Using either fluid acrylic on canvas or alcohol ink on yupo, my artwork captures amalgamations of colour and light, which evoke a broad range of emotions in many people. The process of my fluid acrylic work includes diluting the paint, either with water or medium, pouring it across the canvas, and using blown air to coax the paint into patterns and shapes. Similarly, my work with alcohol ink involves using air as well as brush strokes and isopropyl alcohol to manipulate the paint. 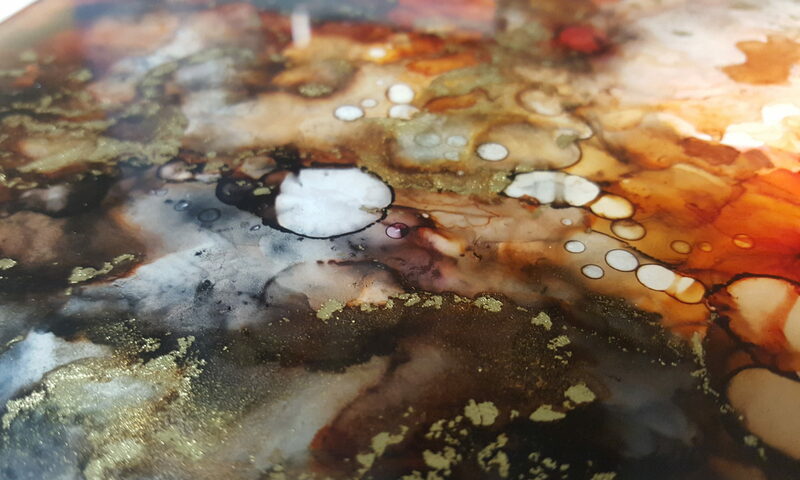 The alcohol ink pieces are then mounted on cradled wood and set underneath a layer of high-gloss epoxy resin, which provides protection and adds depth to the paintings. Alongside commission pieces which I do upon request, my current project is a series of 20 fluid artworks in a range of sizes and colours in which the goal is to emulate designs and patterns that are found in the natural world, by foregoing invasive brush strokes and supplementing them for blown air, either electronically or by mouth. During the creation of one series I consistently find inspiration for new projects, giving rise to the continual transformation of my art.